At the end of the day, you can be on the hunt for ‘that marble look’ – and we have! Take a look at what we’ve found here !! There are some amazing products out there that give you the ‘look’ of marble, with the benefits that come with having a more ‘hardy’ engineered stone, but at the end of the day, nothing quite compares to being able to go to your stonemason and pick your marble look. Individual slabs, quite literally like no other. In choosing marble, you’re choosing a natural, unique product that is beautiful but complex. Marble is softer than a man-made coposite engineered stone. If you’re not careful, it will scratch. If you’re not careful it will stain. Marble ‘etches’ if acids from things like fruits or perfumed cleaning products are not properly and quickly cleaned from the surface. This can be somewhat minimised if you choose a ‘honed’ finish (as opposed to a polished, gloss finish), as the etching can be less visbile. Because the surface is soft though, over time, this etching, or marking does fade into the surface. Marble can be buffed to remove or minimise its imperfections or marking, and stonemasons recommend that you buff and re-seal your marble tops yearly. At the end of the day, there is literally nothing like having a marble top. 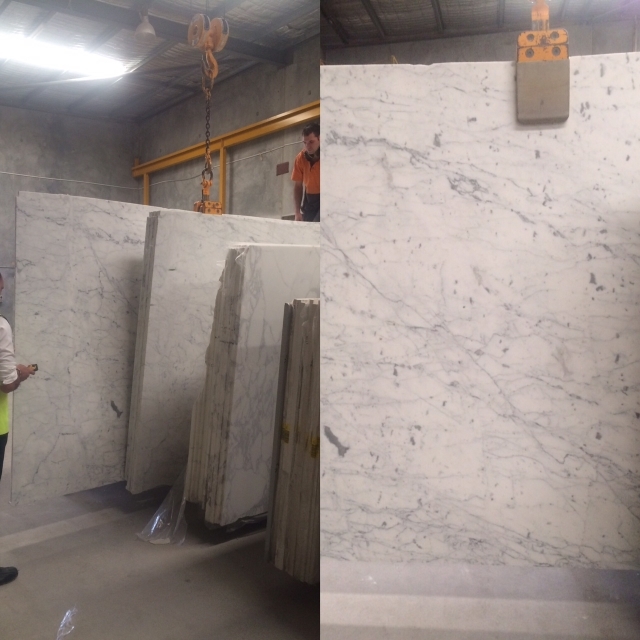 If you’re after something like no other, you can’t get anything more unique than a piece of natural marble that is like no other on Earth. But be aware- take care! For tips on caring for your stone, check out our ‘Caring for your Stone’ page.